"I'm very relieved," Harry Richard said Thursday. 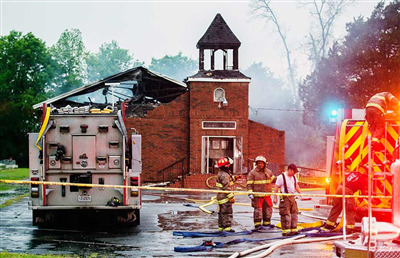 He is the pastor of Greater Union Baptist Church, the site of the second fire. "This takes a lot of the pressure off us in terms of who was behind all of this. I'm very relieved." The arrest was confirmed late Wednesday by U.S. Attorney David C. Joseph in a news release. Details, including the suspect's identity and race, were not immediately clear. Louisiana Gov. John Bel Edwards was among authorities planning to attend a Thursday morning news conference in south Louisiana's St. Landry Parish. There, more information was expected on a case that had rattled many in the area. "I would like to know whether he was working alone or not," the Rev. Freddie Jack, of the Seventh District Missionary Baptist Association said Thursday morning. "We can't let our guard down."